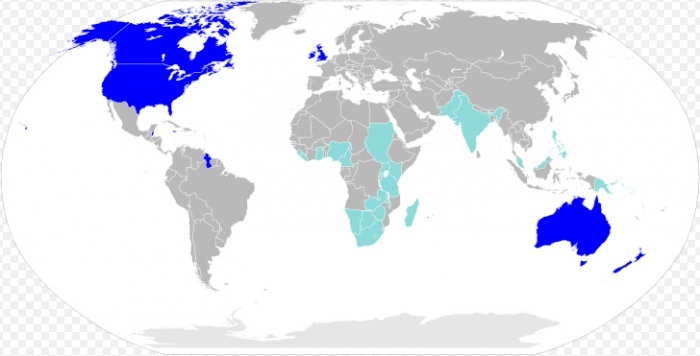 Halloween is celebrated in the USA, and has become popular in Europe, too. Many children and adults go to Halloween parties, wearing scary costumes and masks. American children take their costumes and masks to school. Some typical Halloween costumes are witches, ghosts, skeletons, monsters, vampires and aliens. Many parents make the costumes, but some prefer to buy them. In the afternoon the children put on their costumes and have a Halloween party at school. Pumpkins, ghosts, witches and bats decorate the school hall and the classrooms. There are, of course, party games. One is called “bobbing for apples”. To play this game you put water and apples in a big bowl. The apples stay on top of the water. You must take an apple out of the water with your teeth, but you can’t use your hands. It’s not easy! Many people get very wet! Another popular Halloween tradition is “trick or treating”. This began in the 19th century, and was an Irish tradition. Irish immigrants brought “trick or treating” to the United States. Today children and teenagers go “trick or treating” in the evening. They visit their neighbours’ houses in their costumes. When the door opens they say “Trick or treat?” People usually give them sweets of money. But when people don’t give them a treat, the children play a trick. They sometimes write on windows with soap or even through an egg at the front door of the house. 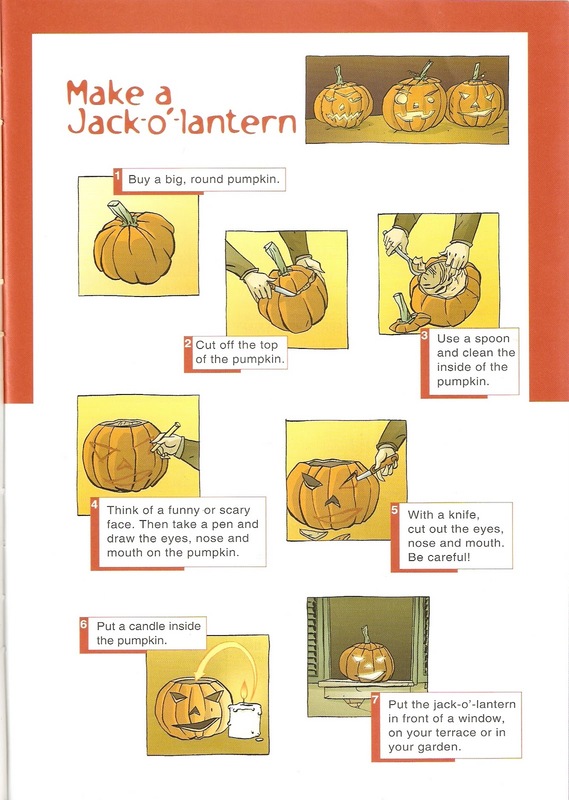 It is a popular tradition in the USA to buy a big pumpkin and make a jack-o’-lantern. People put their jack-o’-lanterns in front of the windows of their homes or in their gardens. This tradition originated in Great Britain and Ireland, when people wanted to frighten evil spirits. 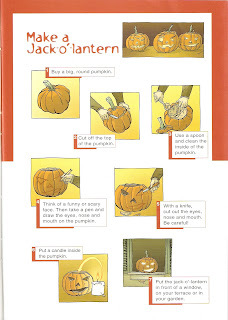 If you want to have your own jack-o'-lantern follow the indications given in the picture above. Remember that the more frightening the face in your lantern, the better. October 31st is Halloween. It is a fun event in the United States, Great Britain and, now, in many other countries too. Halloween has Celtic origins. The Celtic calendar was in two parts: summer and winter. Summer was from May to the end of October, and winter was from November to the end of April. The ancient Celtic festivity Samhain celebrated the end of the year: the start of winter. It began on the evening of October 31st and continued until the next day. Druids were Celtic priests. On October 31st they performed religious rituals and talked about future events. The Celts believed that ghosts, witches, and evil spirits returned on the night of October 31st. They believed that evil spirits entered the body of a person or animal. They wore frightening costumes and made big fires to send them away. The colours of Halloween -orange and black- are of Celtic origin too. Orange was the colour of the harvest, and black was the colour of winter and long nights. The Druids believed that black cats had special powers and could feel if spirits were near, so black cats have become symbols of Halloween. The Romans invaded Great Britain in AD 43. After this invasion Samhain became a harvest festival, and on October 31st the Romans honoured their goddess of fruit trees, Pomona. During the centuries, the Roman Catholic Church put Christian festivities in the place of pre-Christian festivities. In the eighth century the Church decided to call 1st November All Saints’ Day. Another name for this day was All Hallows’ Day. The evening of 31st October was All Hallows’ Eve. This became Halloween. D.B. CLEMAN, Gina. British and American Festivities. Black Cat Publishing, 2004. - When do we celebrate Halloween? - What are the origins of Halloween? - Who were the Druids? - What are the colours of Halloween? First steps are always difficult but if you are as enthusiastic as I am, everything is easier. This Blog is a new project launched by and from our school, Colegio Santo Angel, in order to foster the interest and study of English as a foreign language. Everyone is invited to join and participate so I hope to see you around very often!! I'd like to welcome you and I really hope we all have a whale of a time!! !